The Math One Home Study Kit teaches children to skip count by one's, two's, five's and tens, identify ordinal position to tenth, master all basic addition and subtraction facts, measure using inches, feet, and centimeters. 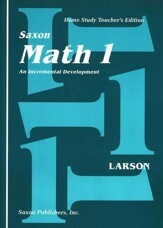 Also teaches how to add quarters, draw polygons, and observe information from real graphs, pictographs, and bar graphs. 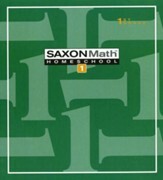 This homeschool teacher's guide accompanies the Saxon Math 1 Student Workbooks. Scripted lessons are included for each chapter, with dialogue, chalkboard sketches and more. Reduced student pages are also included for easy tracking and communication between student and parent. Lesson preparation lets teachers know the materials they'll need and any "the night before" preparation. Answers are lightly overlaid on the reduced student pages. 703 pages, softcover, spiral-bound. This student workbook set includes everything your student needs to get the consistent practice needed for understanding math. 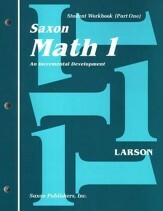 The two workbooks include over 130 worksheets as well as assessment forms. Twenty-six pages of color-coded "fact cards" provide plenty of addition, subtraction, multiplication, and division review.